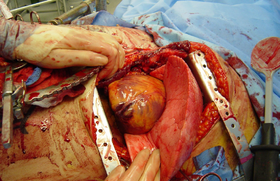 A left-sided thoracotomy incision, allowing direct access to the pericardium, heart, left hilum and left lung. A resuscitative thoracotomy (sometimes referred to as an emergency department thoracotomy (EDT), trauma thoracotomy or, colloquially, as "cracking the chest") is a thoracotomy performed to resuscitate a major trauma patient who has sustained severe thoracic or abdominal trauma and who has entered cardiac arrest because of this. The procedure allows immediate direct access to the thoracic cavity, permitting rescuers to control hemorrhage, relieve cardiac tamponade, repair or control major injuries to the heart, lungs or thoracic vasculature, and perform direct cardiac massage or defibrillation. For most persons with thoracic trauma the procedure is not necessary; only 15% of those with thoracic injury require the procedure. A resuscitative thoracotomy is indicated when severe injuries within the thoracic cavity (such as hemorrhage) prevent the physiologic functions needed to sustain life. The injury may also affect a specific organ such as the heart, which can develop an air embolism or a cardiac tamponade (which prevents the heart from beating properly). Other indications for the use of this procedure would be the appearance of blood from a thoracostomy tube placed that returns more than 1000-1500 mL of blood, or ≥200 mL of blood per hour. For resuscitative thoracotomy to be indicated, signs of life must also be present, including cardiac electrical activity and a systolic blood pressure >70 mm Hg. In blunt trauma, if signs of life, such as eye dilatation, are found en route to the hospital by first responders, but not found when the patient arrives, then further resuscitative interventions are contraindicated; however; when first responders find signs of life and cardiopulmonary resuscitation time is under 15 minutes, the procedure is indicated. The use of a focused assessment with sonography for trauma may be performed to determine the need of the procedure by finding free floating fluid in the thoracic cavity. A left anterolateral thoracotomy is the common method of opening the chest, as it provides rapid access, can be easily extended into the right hemithorax, and provides access to most of the important anatomical structures during resuscitation including the aorta. First an incision is made along the fourth or fifth intercostal space (between the ribs), intercostal muscles and the parietal pleura are divided, and then the ribs are retracted to provide visualization. When the incision covers both the right and left hemithoraxes it is referred to as a "clamshell" thoracotomy. The clamshell thoracotomy is used when there is a right sided pulmonary or vascular injury, or when greater access or visualization is desired. Usually those who undergo resuscitative thoracotomy do not recover—only 10% of those receiving it after sustaining a blunt injury and 15–30% of those with penetrating trauma survive. The procedure was first utilized during the late 1800s by Schiff in conjunction with open cardiac massage. Shortly after it was also used by Block to treat heart lacerations, and the first suture repair performed in 1900. Before external defibrillation and cardiopulmonary resuscitation came in the 1960s, emergency thoracotomy was the preferred way to treat cardiac arrest. ^ November 27, 2012. Resuscitative Thoracotomy. San Diego: The Division of Trauma/Surgical Critical Care/Burns is part of the Department of Surgery, UC San Diego Health System. ^ a b Biffl, L. Walter (September 2000). "Resuscitative thoracotomy". Operative Techniques in General Surgery. 2 (3): 168–175. doi:10.1053/otgn.2000.17741. ^ Seamon MJ, Chovanes J, Fox N, et al. (September 2012). "The use of emergency department thoracotomy for traumatic cardiopulmonary arrest". Injury. 43 (9): 1355–61. doi:10.1016/j.injury.2012.04.011. PMID 22560130. Retrieved 2013-01-01. ^ a b Hunt PA, Greaves I, Owens WA (January 2006). "Emergency thoracotomy in thoracic trauma-a review". Injury. 37 (1): 1–19. doi:10.1016/j.injury.2005.02.014. PMID 16410079. Retrieved 2013-01-01. ^ Brohi, Karim (6 June 2001). "Emergency Department Thoracotomy". Trauma.org. Retrieved January 1, 2013. American College of Surgeons. Committee on Trauma (2008). ATLS, Advanced Trauma Life Support for Doctors. Chicago, IL: American College of Surgeons. ISBN 9781880696316. Andrew B., MD Peitzman; Andrew B. Peitzman; Michael, MD Sabom; Donald M., MD Yearly; Timothy C., MD Fabian (2002). The trauma manual. Hagerstwon, MD: Lippincott Williams & Wilkins. ISBN 0-7817-2641-7. Feliciano, David V.; Mattox, Kenneth L.; Moore, Ernest J (2012). Trauma, Seventh Edition (Trauma (Moore)). McGraw-Hill Professional. ISBN 0-07-166351-7. This page was last edited on 21 June 2018, at 03:36 (UTC).